I am honored to be able to share Tim's story today in another Bake Somebody Happy guest post. It was an absolute joy to bake with him. Here's to more men in the kitchen! I still can’t believe I am sitting down to write a blog about baking a pie. Well, I guess technically I baked it, but Erin was by my side guiding me through the entire process so I wouldn’t mess it up. I am sure I could have managed on my own, but I needed this pie to actually taste good. So why not recruit the help of a pie wizard like Erin? After all, she is responsible for this endeavor. When she asked all of us that were lucky enough to attend her Pi(e) Day Party to “pie it forward” and bake somebody else happy, I thought it was a great idea and had every intention of one day fulfilling this request. Little did I know that it would only be a few short months later and it would be for a woman that I love dearly. Funny how things work. I don’t bake and I don’t fall in love easily... And I definitely don’t write about it to share with the entire pie loving world - which is everybody right? Who doesn’t love pie? Pie beats cake everyday of the week and twice on Sundays. When I asked Will and Erin who I should bake a pie for, Erin right away suggested that it be for a girl as a way to impress her. Of course, I shunned that idea. 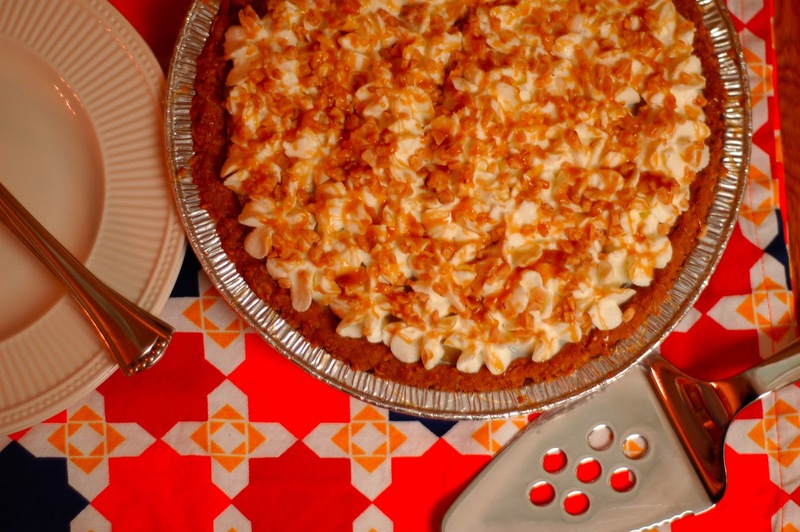 What kind of creep bakes a pie for a girl they just met? PIES ARE A BIG DEAL! Bigger than flowers, bigger than a home cooked dinner. To my own detriment I tend to move slow, making sure I really like someone before I go all out. I am somewhat particular and can be slow to open up. But this was different. I knew Kristi was “pie worthy” by the second week of dating. Maybe even the second date. Now that is fast. PIE IS A BIG DEAL. Of course my closest friend and his wife would be the first friends that Kristi was introduced to. Will was concerned that they wouldn’t be the first to meet her. This made me realize that he could already tell how important Kristi was to me by how I talked about her. I am happy to say that Will and Erin gave their stamp of approval and are extremely happy for us. Kristi, like me, thinks Will and Erin are pretty awesome and have a beautiful family. If your friends are any reflection of who you are, I definitely put my best foot forward with this introduction. I am lucky to have such great people in my life who look after me. Little did Kristi know that during this first visit for dinner, I was already talking to Erin about possibly baking a pie for her. I think Erin was more excited than I was. As usual, I down played this pie baking adventure. It was no big deal, just making a birthday pie for someone I love. Oh, that’s right. THIS PIE IS A BIG DEAL. My idea for the recipe for Kristi’s birthday pie was to combine a few of her favorite sweets. This included Cold Stone’s Oatmeal Cookie Batter ice cream and oatmeal butterscotch cookies. 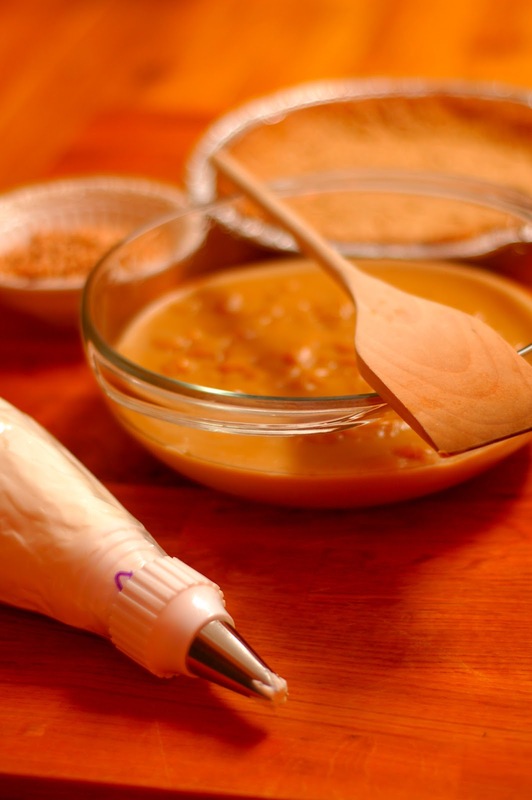 After discussing the idea with Erin and exchanging a few emails, she came up with a great recipe for a pie with an oatmeal cookie crust and butterscotch custard filling - just what I was looking for. My only request was to add a whipped cream topping and possibly some butterscotch syrup. Once the recipe was perfected, I was off to the store with the list of ingredients we needed to complete this masterpiece. Kristi was out of town for work the night before her birthday, so it was a perfect time to bake the pie. I just had to tell a small little tale about going out to dinner with Will so she would not be suspicious when I missed her nightly call. We first started by making the oatmeal cookie crust. A whole stick of butter and half cup of brown sugar - oh this was going to be good. 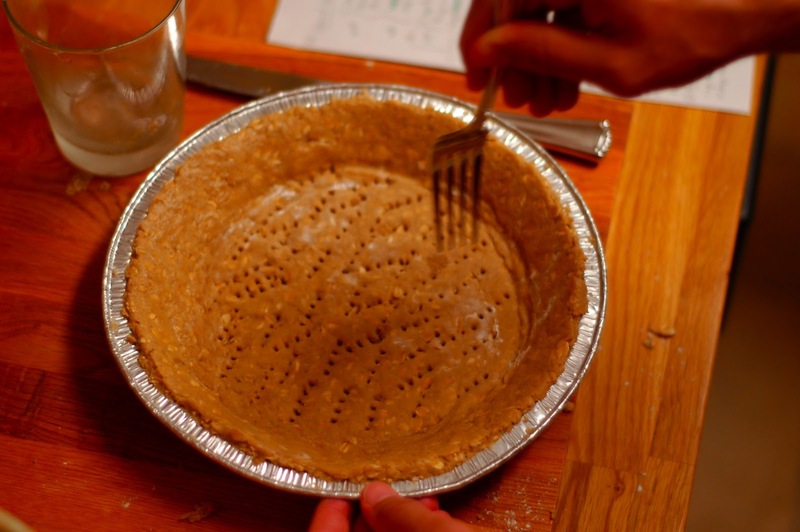 The crust came together fairly quickly and it was time to press it into the pie tin. Trying to get it nice and evenly dispersed in the pan was a little harder than I thought. Being a perfectionist, I couldn’t leave it alone and kept fighting with it to get it just right. With a little help from Erin, it was ready to set in the refrigerator while we made the filling. Being a sucker for chocolate pies, I was not sure that the butterscotch custard filling was going to be as good. But when we started heating it over the stove, it smelled delicious and I couldn’t wait to give it a try. With the amount of brown sugar that went into this filling, I may have a new favorite pie. Well, actually it was already going to be my favorite pie for many other reasons than just the flavor. Once it thickened up a bit, it was time to put it in the refrigerator to thicken some more before we poured it into the pie crust. 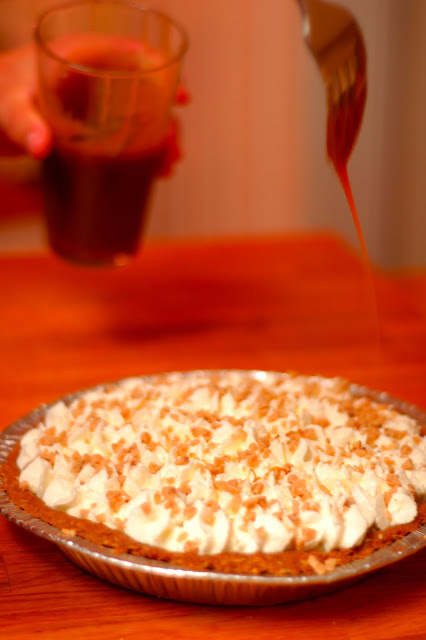 It was now time to put the pie crust into the oven and move onto the finishing touches for the pie - the whipped cream topping and butterscotch syrup. I had no idea how easy it was to make homemade whipped cream and it tasted great. At this point, we could smell the oatmeal crust cooking and I began thinking to myself that this pie was going to be awesome. Awesome enough to make me want to attempt another pie in the future. Maybe Kristi could help me with that. The butterscotch syrup came together perfectly, taste tested and approved by the great bearded one. It’s funny how Will was chiming in as the flavor expert - I felt like we were on an episode of Chopped. But, we all agreed that it was really good. Getting the crust cooked just right without burning the edges was a big concern, but I think we pulled it off. Pouring the butterscotch custard into the pie crust, we were almost done and it was looking like a real pie! It was getting late, but we still had a few finishing touches. It was fun to try to get perfect little stars of whipped cream on top, I think I did a fairly good job. Then it was time to decorate it with the syrup, which was pretty fun. It felt like splattering paint on a canvas, but then I just wanted to keep adding more! 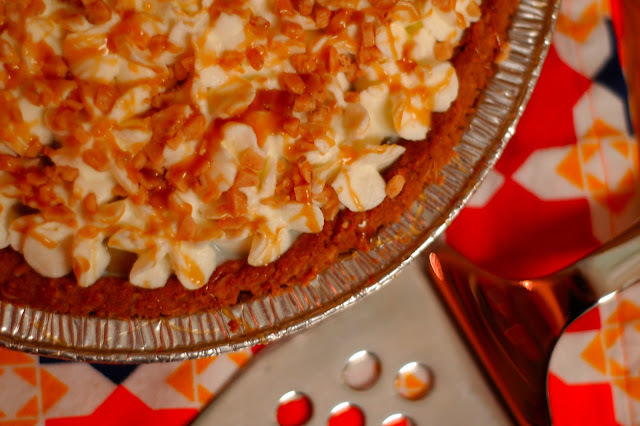 The last ingredient was the only part of this pie that was not homemade, but was the perfect touch - bits of toffee. This was Erin’s idea and I think it was great. I have to say I was pretty proud of myself at this point, this pie looked amazing. We took some photos of the pie and it was time to box it up and get it home to the fridge before it melted. Now just to think of a clever name that would accurately describe this pie and how special Kristi is. My mind was drawing a blank, but at the last moment I just wrote what I felt and thought it was a worthy title. Thus, Kristi’s “Happy Birthday Beautiful” Better Than Cake! Butterscotch Oatmeal Pie. A bit long, but pretty much sums it up. I could not wait to get home from dinner so I could give Kristi her pie. I told her we could not have dessert at the restaurant because I had something better for her waiting at home. I really hoped this was the case - I think it was too late to go out for ice cream at this point if the pie was not a success. As I brought out the pie, complete with birthday candles to Kristi, I could not have hoped for a better response. She had a great big smile on her face and was completely surprised. I had hinted at doing something special for her a while back and thought she might have figured out what it was, but she had no clue! This was a great birthday present and the first time anyone had baked a pie from scratch for her. I am so happy that she thought PIE WAS A BIG DEAL, too! After getting her to pose for a few photos, it was time to dig in and find out how good this pie was. It definitely surpassed all of my expectations and we both loved this pie. I think all of Erin’s pies have been pretty amazing, but this one was probably the best. But, in all fairness, I am a little biased. Kristi loved this pie and I was so happy I could make it for her birthday. It is the little things in life that can make the biggest difference and I am glad that this small gesture could bring her so much joy and show her how much I love her. I am positive I have driven Erin nuts with how long it has taken me to write this blog for Bake Somebody Happy, and hopefully my words are worthy of her great webpage. It is a wonderful idea and I am glad I could be a part of it. Kristi and I are looking forward to coming up with another pie to bake together, so I can help her “pie it forward.” Hopefully she will have a blog to share in the future! I could not be happier with how this pie turned out and I could not be happier now that I have found Kristi.